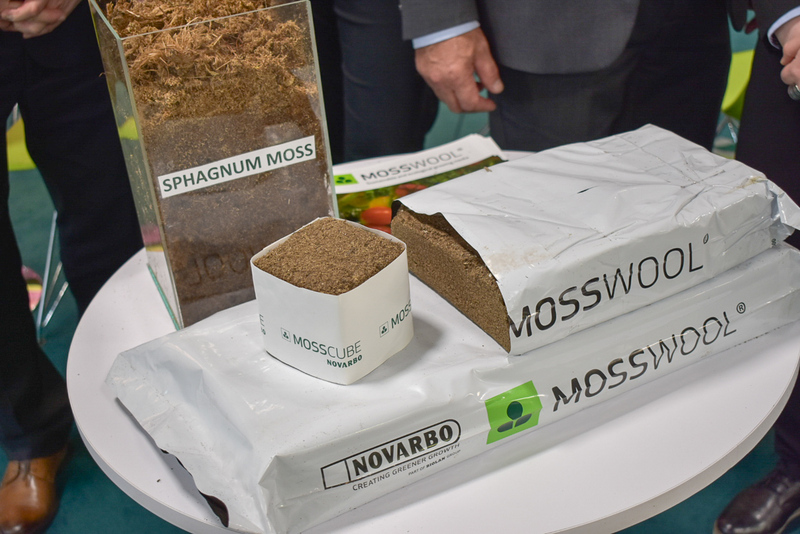 "Better production with sustainable addition to peat"
The first Mosswool factory is currently being completed and will be operational within this year. 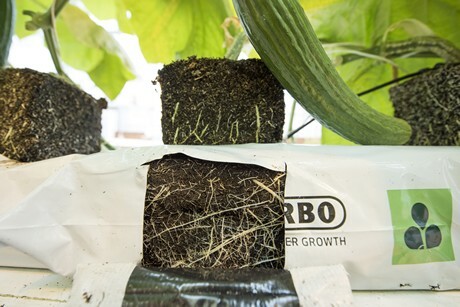 What is this new growing medium, and why is supplying company Novarbo Oy so enthusiastic about it? According to Pirita Luolamaa-Vollebregt, it’s a sustainable addition to peat, as the Mosswool regrows within a couple of years and the product can be composted. The Novarbo team at the Fruit Logistica last week. Second on the left is Pirita. “We want to test it in both research circumstances as well as real-life cultivation. That’s why currently crops are being grown on Mosswool at both Tomato World and Wageningen UR. After positive trials in Finland, I’m very excited to see what this will bring.” This says Pirita Luolamaa-Vollebregt with Novarbo Oy, focusing on the cultivation with this relatively new product. Mosswool is made of sphagnum moss, which is harvested using a patented ecological method. Mosswool slabs are a combination of moss and peat, processed in airy cultivation mats that keep their shape throughout the cultivation. Afterwards, mats can simply be processed as green waste. 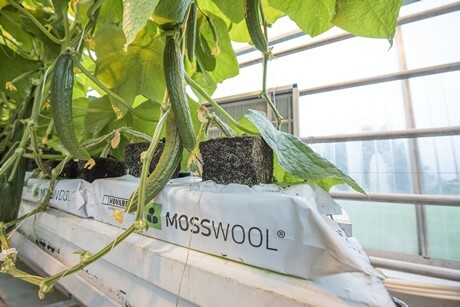 According to Pirita, Mosswool saves money for the greenhouse farmer, as waste costs are lower because used slabs can be composted together with crop residues. "But most importantly, Mosswool growing slab is the drop-in sustainable replacement to stonewool. EU regulations state that stonewool filled with living root mass may not be dumped in landfill. After one year of usage stonewool will be problematic waste, which does not burn or decompose. Mosswool solves this issue since it can be easily locally composted with the crop residues or recycled after use, which minimizes disposal costs”. 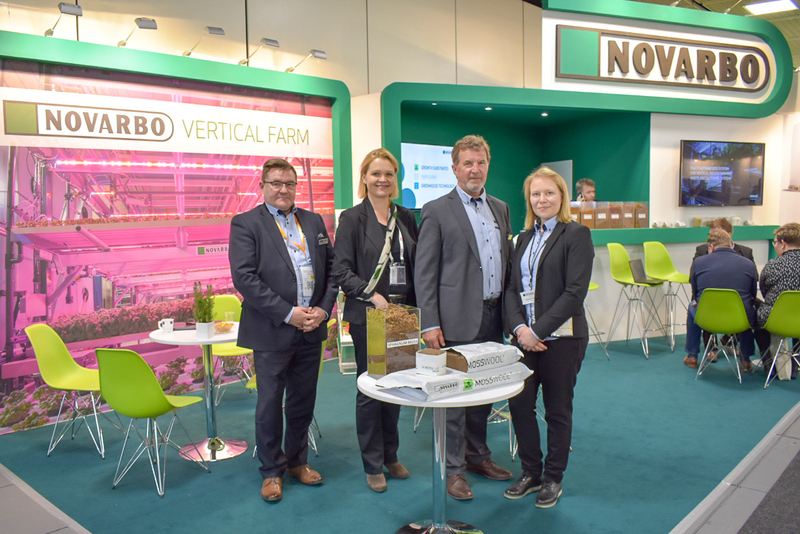 With regard to the company’s future plans, Luolamaa-Vollebregt says Novarbo is already looking forward to the end of 2019 to improve its presence in the Netherlands, Germany and Belgium. “I will assist them in this. I myself come from Finland and have been working in the horticulture industry in the Netherlands for more than 20 years. Since 2010, I run my own company in the Netherlands that exports flowers and plants to Finland. Import fits well and I feel very connected to the ecological value of this product”. 2019-03-06 "Producing for Turkish market and exporting to surrounding countries"
2019-02-14 "Sustainable medium to grow microgreens with"
2019-02-14 "Better production with sustainable addition to peat"
2019-02-11 "Year-round stable supply of substrate is becoming increasingly important"
2019-02-01 "Real-time insight enables growers to directly improve their cultivation practices"
2019-01-23 "We provide access to a more sustainable way of growing"
2018-12-11 "Mars and Mull share similar soil"